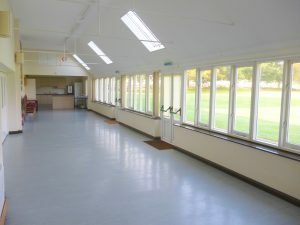 was built as an extension to the original hall, and has conservatory style windows with expansive views of the village green and skylights providing a light and airy ambience. It can be accessed independently of the Main Hall or used in conjunction with it. The room has an area of approximately 60 square metres, being 16m long by 3.7m wide (53ft x 12ft), excluding the catering area. The licensed capacity is 120 for close seating (e.g. lectures) and 60 for seating at tables, although a more comfortable capacity might be 60 and 40 respectively. 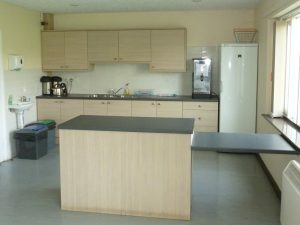 Dedicated catering/bar area with its own full height refrigerator, boiling water dispenser, sink and hand washing facilities, independent of the Kitchen. There is also a bar counter with a lower section to allow access for wheelchair users and children. Details of crockery and glasses for hire and other items that may be of use can be found here. The Booking Secretary has information on Caterers and Mobile Bars. 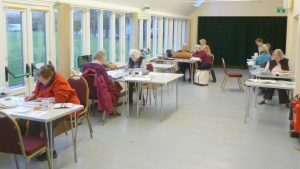 Copyright © 2019 Lavant Memorial Hall version 1.10 | Theme by SiteOrigin.